The boat PVC is the most popular craft of the modern angler. The ratio quality-price of this boat the best in comparison with all analogues. Lightness, durability and compactness are the main parameters that determine the functionality of this craft. However, even with such plavsredstvami can be the most unpleasant event. It can be punctured by sharp river snags or fishing equipment. “How to seal a PVC boat to feel confident on the water?” – this question is interested in a great army of fishermen, faced with similar problems. Today, the boat PVC is a combination of modern materials, components and technologies. Therefore to harm this modern product is not so easy. However, fishing can be the most unpredictable situations. 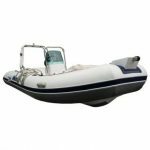 We consider in this article several types of troubles that can occur with inflatable boats. For repair it is necessary to blow off the boats, otherwise the air pressure will prevent quality repairs. This is the most common damage boats made of PVC. The size of the puncture is usually up to 5 cm Occur it may due to the primitive effects – burns, stab fishing equipment. How to seal the corruption that it is the most reliable? Cut patch of material which is included in the kit. Its size should be larger than the diameter of puncture approximately 3 cm Form the patches should not contain right angles. Most often it has the form of a circle or oval. Planned the repair to wash and degrease with solvent. The use of sandpaper in the repair of PVC is absolutely contraindicated, and if there is no solvent you can use alcohol or acetone. For ease of handling of the adhesive surface of the patch is applied to the puncture and fortified with a pencil. For gluing it is necessary to use a brush and apply glue to the surface evenly. After drying the first layer, which is typically 10-15 minutes, evenly applied to the second layer. The second layer dries out more quickly – about 5 minutes. Slight heating ispolzovany surfaces improves the activation of the adhesive. Such heating can be done with the Hairdryer. After the contact of the bonding surfaces must firmly. Perfect for this purpose, the roller that evenly smooth out the glue and squeeze out the air. In the absence of a cushion you must use any other available rigid media. Drying time depends on the glue, but usually it amounts to about a day. Attention! If the puncture is small and there is a question about its location. To detect the puncture site very easily. It is necessary to use soap solution. The presence of bubbles will indicate the location of intended puncture. Gluing one patch from the inside and the other outside. Despite the fact that inside somewhat problematic to seal, but this option is considered more reliable. Splicing occurs in two stages – the outer patch is glued after drying the first. Gluing two patches on the outside. The size of the second patch needs to be on all sides 2 cm larger than the size of the first. Typically, the hole on the bottom has a ragged nature and very often impressive size. These injuries are due to acute snags, which is a very fast river very dangerous for watercrafts, such as rubber and PVC. Therefore, before sealing the wound sewn up the coarse thread. Patches seal with two sides – internal and external. Fusion algorithm is the same as the damage described above. Failure of this element of the boat is in most cases due to mechanical damage. To replace the valve will need a special key, the analogue of which it is easy to make yourself. This would require a plastic pipe of the required diameter and a jig saw. in some cases of severe dry. Kernil – heavy-duty reusable adhesive. Superglue is not suitable to repair the boat. Despite the fact that he bonded immediately, holding the patch it will not. Polychloroprene adhesive is applied once, and polyurethane adhesive two times. Polychloroprene adhesive, it is desirable to heat during application, but not necessarily. A polyurethane adhesive should be heated with a Hairdryer to 70°C is mandatory. So, seal the PVC boat is usually for any angler is not difficulties. The main thing – the availability of necessary supplies and time. However, the repair must be carried out carefully in the first place, knowing what to use a PVC boat will be in water in a variety of conditions. Therefore, improper repair in some cases can lead to unpredictable consequences. And how to correctly glue the boat must know almost every boater.